Backtrace. Even the bland title smacks of a forgettable straight-to-VOD actioner with has-been or never-was stars. 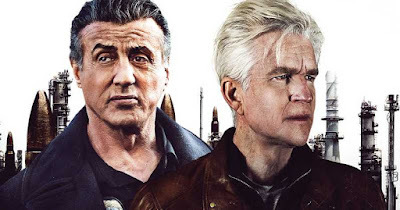 And while the film may indeed end up being a momentary blip in our cinematic memory the one thing we can't say is that it has a washed-up star, because Sylvester Stallone is anything but done. Stallone leads the cast of Backtrace which...okay, maybe his co-stars Matthew Modine and Ryan Guzman fit the has-been/never-was model. This one is pretty wild in theory; with Modine playing a man who suffers a traumatic brain injury after a heist gone south, ending up with amnesia. After being held in a psychiatric ward for seven years, he breaks out of prison and is injected with a serum that makes him relive the life he's forgotten. He'll need to confront the past and retrieve the stolen money all while being chased by a dogged detective played by Stallone. Whoa. Prison breaks, mysterious formulas, amnesia, lost money, hard-nosed cops, a-hole FBI agents; it's a cocktail of bad action movie tropes. This might end up being really lame but I'd be lying if I said it didn't have my interest. Also starring Meadow Williams, Christopher McDonald, and Colin Egglesfield, Backtrace hits theaters and VOD (let's be honest, if you see this it'll be at home) on December 14th.